Five years ago, Wildlife put out a little heard EP to help promote themselves while they toured. It was a step up from their idealist start, with singer/guitarist Dean Povinsky and original guitarist Darryl Smith leaving Kingston, Ontario, for Glasgow, Scotland, to start a band three years prior. Incidentally, the EP was never released in England. After returning to Toronto with a little less naivety, a little more experience, and a greater appreciation for home, Wildlife rediscovered an increasingly dynamic music scene inside Canada. The band was better rounded too, as Povinsky was joined by Graham Plant (guitar, vocals) Derek Bosomworth (bass, vocals), and Dwayne Christie (drums). Tim Daugulis (keyboards) joined in 2009. 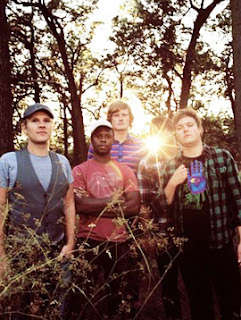 Within two years, they signed with Easy Tiger Music to set down their debut album. It took another three before the band would have time to step back into the studio again, this time with producer Peter Katis (Interpol and The National) for part of the album; and Gus Van Go and Werner F (The Stills, Hollerado) for the other part. Wildlife wear their hearts on their sleeves for a change. With a new album entitled ... On The Heart, Wildlife could have taken this sophomore outing in almost any direction. Fortunately, they mostly avoid the sappier sentiments and play to its passion, good and bad. The first six tracks on the 12-track album retain an indie rock vibe before the pop tracks soften it all up. Right. Just as a heart has a right and left side, so does the album. The right side is a little darker, beginning with the opener If It Breaks. Povinsky, who is often identified by his youthful experience, perfectly captures a rare combination of uncertainty and sadness in the short span of a 2:20 introduction. While not much of a song, it strikes all the right chords before the more primal Born To Ruin. After opening with a reliance on percussion, Wildlife lays down one of the best songs on the album. By the third track, it becomes exceedingly clear that ... On The Heart is a many layered album. Bad Dream is a broken heart love story, the price people play for falling in love too young or maybe the first time. It's arresting as much as it's engaging, even when Wildlife slows the pace for Don't Fear and the teaser, one-minute atmospheric Arrythmia. The bottom half of the album slips a bit, with the band sneaking in some atmospheric arrangements reminiscent of the pop scene three decades ago. It doesn't necessarily miss, but definitely leaves behind some indie sensibilities for something more commercial at times. Guillotine feels much the same, but with infinitely better lyrics, as does the rest of the album. While the bottom half will perhaps appeal to a pop crowd, the distinction does play to the notion that producers can have a tremendous impact on a band. Although Katis had some final influences on the mix, the overall album does exactly what Povinsky says it does. "It answers a lot of questions Strike Hard, Young Diamond asked, and presents new ones," he said. Perfectly said. Although Strike Hard, Young Diamond was well received, many reviewers asked if Wildlife could settle down into a sound. ... On The Heart proves they can, narrowing the direction down to two paths. The question that remains is which path will they take if they take one at all. Personally, I lean toward the indie rock influences in the top six tracks because the band has the talent to keep their music instrumentally interesting. It's the finesse that makes their music memorable, even if Povinsky is strong enough to carry a pop band with his lyrical and vocal talents as Guillotine, Bonnie, and Lightening Tent prove. It's good indie pop, but not as strong as tracks like Born To Ruin. Wildlife Takes On The Heart With 5.1 On The Liquid Hip Richter Scale. Had the entire album carried the strength of the first six tracks, this album would have rocked even higher. Even so, ...On The Heart is decidedly dynamic in that Povinsky and Wildlife set out to pay homage to the heart, exploring every airy elation and dark corner of passion. In that, they succeed. On The Heart by Wildlife is up on Amazon. You can download On The Heart from iTunes. Their next show in Toronto is right around the corner. Visit Facebook for upcoming tour dates and expect more from the band. They have potential in either direction, even if we have our preferences.